Cut out 12 large pastry discs using a 9cm fluted cutter then using a small heart cutter, cut out 12 hearts. Line a muffin tin with the discs. Prick each base with a fork and line with a small square of greaseproof paper. Add a few baking beans, then blind bake for 5-8 minutes until just cooked. Remove the baking beans and paper, press the pastry down in the centre if necessary and return to the oven for 1-2 minutes. 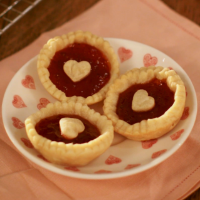 Put a heaped teaspoon of jam into the centre of each tart being careful not to overfill and top with one of the hearts you cut out earlier. Return to the oven for 5-8 minutes. Transfer onto a cooling rack and allow to cool slightly – they’re best served just warm.